While the first season was a great interpretation and reinvention of one of my favorite movie franchises, Lethal Weapon season 2 goes beyond that. In a quick review that will have some spoilers I must say that season 2 makes a very emotional connection with the audience. I’ve found myself invested in the characters and really enjoying the story telling. The mixture of action, humor, and ongoing plot points continues to reel me in. Then I heard that co-lead actor Clayne Crawford would not be returning as Martin Riggs after being fired. Originally I was mortified that this was true. How could you have Lethal Weapon without Riggs and Murtaugh? Well while we don’t have definitive answers short of Seann William Scott replacing Crawford as a lead, I think the finale of season 2 gives us a hint of what we will have. Perhaps there will be a new Riggs coming aboard, related to the main character and in a tasteful and hopefully non-forced sort of way. We can only hope there will be chemistry between him and Wayons (who continues to be outstanding in his role). I’m assuming Murtaugh will not take the Captain position in order to solve the murder of his former partner? For season 2 I give it 5 out of 5 sCrypt ratings. What did you think of the show and where do you think they can and will go from here? A viewer wrote in and asked if I’d ever do an episode about the first published author. Here’s a brief summary of what I found. It’s quite interesting. What authors do you find intriguing? Comment below. Twenty five years have passed since a war with artificial intelligence has forever changed the course of humanity. Belief in the first world leader has been gained by the majority, but there are a few who can see past the media bias. As President Jason Black’s scheme unravels, the next step in human evolution begins. A passing of the torch to a newer generation of unexpected heroes occurs as they mount a resistance into the political fray. Led by Zoe Omandi the team is guided into dealing with not only their conflicting personalities, but also their extraordinary abilities. Real world physics makes this more than just a story of superheroes and villains. It is a story about survival and persistance. Can the heroes overcome the odds and unravel the truth before it is too late? Q: How does this trilogy stand out from the last? Rick: Like the Star Wars saga, I tend to think of this as a starting point for newcomers to my work. Books 4-6 are really well written in comparison to the original three because of what there was to work with. It is a lot easier to be more creative with ghosts, demons and technology (the focuses of the novels in Pandora’s Chaos), than it is with zombies, vampires and werewolves (books 1-3 in the Eden’s order trilogy). I wrote it in a way that anyone can jump in from this as a starting point and when it grabs their attention there would be two reactions. If the reader enjoys what they see here, then it will not only compel them to want to see what happens in the next trilogy, but also what happened before book 4 that established this world. Q: Are you always writing in trilogies? Rick: I think that is the most logical approach, yes. I’ve always loved a good series. The problem is finding a part for people to start. Someone might get turned off if they find out there are multiple books and they’re already 6 novels behind. The purpose of trilogy writing is multiple… I can focus on a new antagonist throughout, and have separate threats that are secondary antagonists in each novel. Sure you can read just any individual novel of it, but it really feels fuller with all three. I won’t always write in trilogies, but for this it seems fair. Q: Where will the next trilogy take us then? Rick: Into the future. There is a twenty five year gap between books 6 and 7 in order to introduce a mostly new cast. The past novels have happened and there will be references, but only when necessary. GENETIC MORSELS is going to enable me to do more creatively while building on an already existing world, and yet keeping it fresh and new. Q: What is your take on Pandora’s Box and the whole Atlantis angle you’ve included? Rick: Without giving too much away Atlantis has always been fascinating to me. There is so much that we don’t know about the history of mankind and I wanted to touch on that. I believe that every legend begins with a certain truth. My own ideas for stories are based on realistic things that have occurred in my own lifetimes, so incorporating that with the past really gives me a lot of working room. There had to be something opposite to the order established with the Garden of Eden in the first three novels, so when I wanted a source for chaos I immediately knew Pandora’s Box would be the thing to do just that. My take on it is completely unique to those prior, but still keeping true to what the original idea was. Q: With your next trilogy taking place in the near future, what will you call it? What will it focus upon? Rick: I have a few ideas about what to call the trilogy as a whole, but nothing definitive at the moment. I currently have the rights to my ideas in book 7 and book 8 which will focus on the next step in human evolution and aliens respectively. Q: Is it impossible to tie up every loose end? There are a few characters who I wonder about their fates. Rick: Nothing is impossible, but in order to keep new novels fresh I don’t like to include every little thing that may have gone untouched. Take the fate of Cain. I like to leave that open to the reader to have their own thoughts. It isn’t necessary for me to go back to a place I’ve already been without having really good reason. I try to eliminate the reader question of “what if?” as often as I can. Mostly there are no loose ends. Each trilogy ties it up fairly well. For those things I left open, well I reserve them for the comic book spinoffs. Q: In the Eden’s Order Trilogy there was a timeline and the graphic novel spinoff stories as bonus content. What are the extras included in this trilogy? Rick: As I did in EDEN, I included the novelized stories that are and will be in the comic book spinoffs, plus three new additional stories. They are all short and are just meant to be supplemental material. Instead of a timeline with this one, I included a “document” that drops a hint as to what the main antagonist (I won’t say who here) is trying to do in book 7. Q: I understand that you won some awards for this trilogy. What was that like? Rick: I was blown away. I received extremely positive reviews on SOULS 4 SUPPER and it took the trilogy to new heights. It moved me from non placement on the independent author chart into the top 100… then two weeks later I had been moved into the top 25 of authors. I’m still on an adrenaline rush and am so thankful for all of the feedback and people who made this possible through support and word of mouth. Q: What is the symbolism behind the cover art? Rick: When I approached my brother (Dan Pipito) to do the cover art, we discussed how we could represent all three book themes as well as the underlying plot of it all. The look of an ancient sculpture came to mind, with modifications. In its chest you can see what is my version of Pandora’s Box. Emanating from that is a greenish mist that represents the souls within it. If you look at the wings behind the statue one is feathered and one more like a dragonfly. This is to represent the angels and demons. Finally, the sculpture itself is very mechanical looking with seams and rivets in places, which is where the technology is represented. It is a simple piece with many complexities hidden within (much like the mysteries revealed within the books). Q: Where can we get PANDORA’S CHAOS TRILOGY? I understand the argument that a sequel is never as good as the original. I find the point to be outdated though. Think of modern movies. A lot of times the original movie is an origin story setting up the rest of the would be franchise. Therefore, the first movie, while important to the series, is not always the best. In fact, it rarely ever is. Sure, we can sight a million examples as to this being untrue, but nowadays a series of films is written to act as one, and for that reason it works. Often we end up with a lesser quality trilogy than we would have back in the day… Take the Matrix for example. It in no way is as good as the original Indiana Jones trilogy. BUT Look at the individual movies. With the Matrix, it was the first movie that was great and the other two were subpar for the trilogy. Indiana Jones on the other hand (for me at least) is opposite. I feel that Raiders (while still one of my favorite movies of all time) was no way near as good as the next 2. Let’s not get into the most recent one. I do realize my argument could go either way, but let’s face it. I’m a fan of characters. They are a lot of the time what makes a movie. If I like a character I’d like to see them in another adventure again, even if they have a bad one in between. It’s like that music artist that you really like, but they have one bad album. Do you give up on them? No because you know they will be back with something better. Why is this a topic for my 31 days of Halloween? Because that’s the mindset I have with writing. 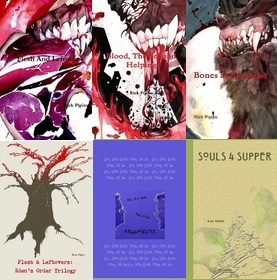 I designed the FLESH AND LEFTOVERS series to be a ten book series in all. I ALSO know that not being caught up with a series may prevent some people from wanting to buy the next novel in fears that they don’t know what is going on. That is not the case here. Yes, FLESH AND LEFTOVERS is my weakest book in the series, but it has also gained a huge audience. It is the weakest because it is an origin story. The characters are just building up here, and by the end of the book you really know what is going on. My goal was to make each one top the prior, not just because I knew my writing would be better with experience, but also because you expect more as the audience. Think of it as the Star Wars of horror. The prequel trilogy is geared for one audience, while the second and third are geared for not just the first, but other audiences as well. Start with book 4 and read that trilogy. Then you can go back and find out what got them to that point, or move forward. Book 10 will be a bookends of sorts. It will be a sequel and prequel to the series, yet stand alone in its entirety. So if you are a stand alone story type of person, or are like me and enjoy an epic saga, or if you just like a good trilogy, then it is all here for you through the links on the right of the page. What do you think? What sequels do you think don’t stand up to the original? What sequels surpass the originals? I’m curious as to what you think, so please share in your comments. I’ve received quite a few emails from those who’ve read my novels, asking, “Rick, when are you going to release your next novel in your horror series?” With all kind words and compliments, I’d like to thank those fan emails. I enjoy responding to each of them. So, I decided that to answer the questions asked, I’ll post on what is in the works. First, my novels: Now that copyrights are in place and my agent gave me the okay, I’m finally able to give a hint as to what the next book is about. 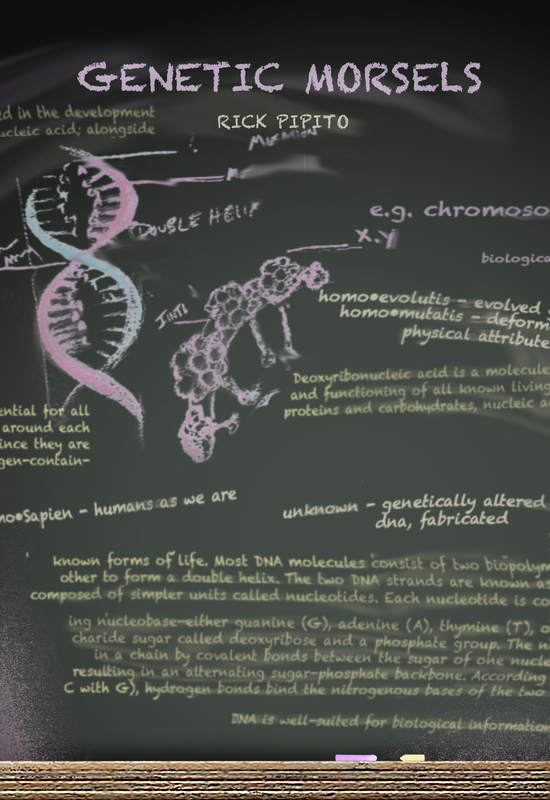 “Genetic Morsels” begins a new trilogy of novels that take place in the not so distant future. The next step in human evolution has begun, and with it is presented a whole new era of conflict. As people with extraordinary abilities struggle to control their genetic code, those who are “normal” worry about extinction. This is not just a novel where people run around in tights like superheroes…. no… in fact, it is the contrary, and based in this physical world, where it is a much more realistic and horrifying take on what it would be like to develop powers. Think about if you could generate fire from your hands, but each time you do it, your hands burn as if placed in a heat source. The powers could be a gift, but they could also kill the user or severly hurt them. Look for this book in 2015. Also in the works is the “Pandora’s Chaos” trilogy. This will compile my novels: “Souls 4 Supper,” “Devil’s Dessert,” and “Techno Feast,” and will have the added bonus of the spinoff graphic novel stories, and some hints as to whats to come for the next trilogy. This is a stand alone trio in the series that will be released in 4th Quarter 2014. Finally, my first book, “Flesh And Leftovers,” is being adapted by sCrypt Sound into an audiobook. I’ve been working around the clock with adapting the audio and working with some amazing voice actors/actresses. It’s been a lot of fun, but consuming much time. Next up, sCrypt Comics: Dan and I would like to officially announce sCrypt Sound. This is a component of our sCrypt brand that opens new doors for us. I record music often, and now that we’ve got a halfway decent studio in place, sCrypt Sound will focus on recording not just my music, but our audio book conversions, as well as any potential future podcasts. 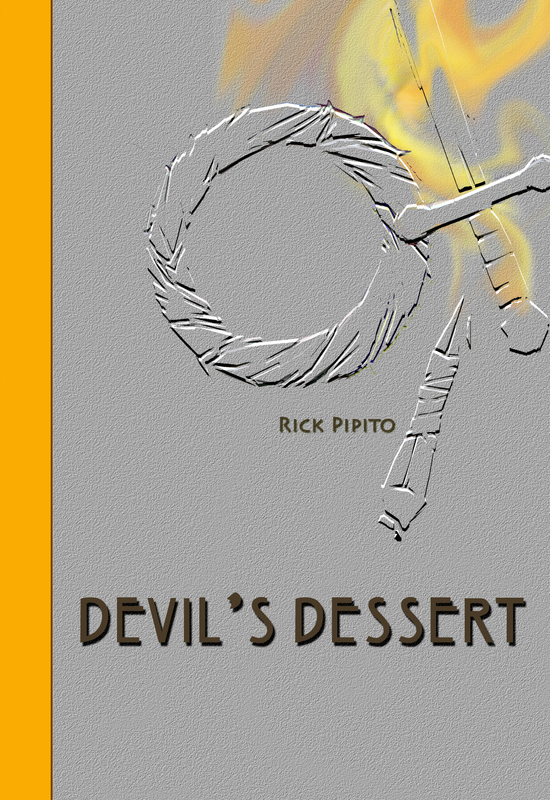 The next graphic novel, “Devil’s Dessert: Demonic Entities” will be released in 2015. We had to take a break from the overwhelming work load of the graphic novels, and are perfecting the stories to be converted into graphic form. We will be announcing artists as soon as this kicks into high gear. Instead of the graphic novel, however, we are working on a children’s book. “A Little Girl In the Land of The Hiccups” is a short story written by myself (Rick Pipito) and will be illustrated by Dan Pipito. To be released this holiday season. Other Miscellaneous works: While Dan is working hard on his own artistic endeavors, I’m gearing up for a summer season of musical fun. For the first time in a long time, I’ll return to the stage as a solo act, playing guitar, singing and harmonica. With a mixture of originals and cover songs, the plan is appeasing all audiences of every type of music. My podcast, “Think About This” is on indefinite hiatus at this time. My cohost (and wife), Roberta, is hard at work with her Homemade Delish brand, and the podcast has had to take a back seat in order to accomplish some goals. We do plan on returning when we can though. In the meantime, I’ve been assisting with her success, and we are both confident that this will enable me to take sCrypt and my works as well as hers to a whole new level and beyond. Save 40% off right now on any or all of my novels. This is a deal that cannot be beaten. 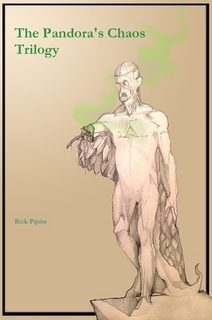 Go to http://www.lulu.com/spotlight/rickpipito, select the book(s) you desire, and enter the code FALLSALE40 at checkout. Now you can catch up or begin the entire series that continues to grow in popularity. Offer ends 11/4/13 at 11:59 pm, so don’t wait. Thanks for the support and spread the word!